What does this Surah mean for us though? We know it has some sort of relevance because Allah says the Qur’an is ‘guidance for mankind’. How then does Surah Nasr relate to our mission, our life and our goal? The Qur’an explains itself; we are not authorised to assign any sort of meaning to it. Even when the revelation was sent to the Prophet , Allah sent the meaning and the wisdom behind each and every letter. And we know that Prophet never said anything out of his own desire/ego. Everything was on the basis of Divine revelations. 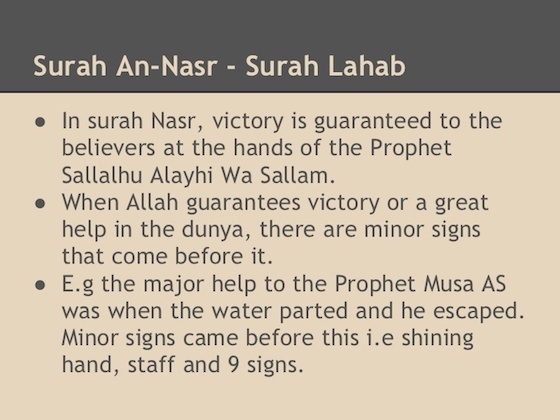 Some may say that Surah Nasr is not applicable to us since Allah is referring to the mission of Prophet alone. Does it then have any relevance to us today? Yes, because the Qur’an is the message for all times. Prophet was a Messenger before creation. 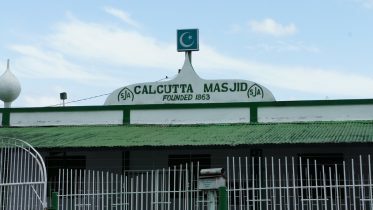 It is recorded in the books of ahadith that Prophet Muhammad is reported to have said ‘I was a Prophet while Adam was still between water and clay’. Imam Ghazali writes that Allah created the Light of Muhammad , his soul, first. He created all and everything from the Light of Muhammad thus all the other souls came from Muhammad’s . Who is He referring to? What kind of victory is Allah speaking about? We have already established that Prophet was sinless, which meant that Allah is speaking to the believers. Understand that when the heart attains ‘peace and tranquility’, when this world has no effect on you, when you only seek Allah’s pleasure and forgiveness, He will forgive all the past sins and the ones that are to come. This is one of the goals of a Muslim’s life; to reach a level where your only concern is Allah . A beautiful example of this can be seen in the conduct of the Great Sheikh, Abdul Qadir Jilani. Once his ship sank and when he realized what had happened he immediately said ‘Subhanallah’ [God be Glorified], illustrating that the worries of this material world affected him not. Keep in mind that when the heart attains peace and tranquility Allah will bestow his forgiveness on you. Work to achieve this. It is a real jihad because no one can do it for you. It is just you and your Lord. Remember whatever is for you, you will get it and whatever tests you undergo has already been written for you. Beg Allah to make this life easy for you and attach yourself to Him and insha Allah He will bestow that tranquility in your hearts. Be the first to comment on "The Manifest Victory from Allah"
Arrived on the very first ship to bring indentured immigrants from India the Fath al Razack. He is listed No 4 on the ship’s manifest….